How much of any situation do we think we see? We often act on the assumption that what we see is what there is. What we perceive is the way things really are. Thus, often our actions are doomed to disastrous effect. 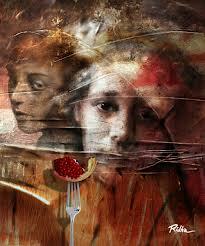 The problem for human perception is that we are most likely to see only that which is already recognizable to us. One of my favorite phrases is: the mind sees only what it is already looking for. We are trapped within the limitations of past experience. The brain, that amazing organ, still in evolutionary terms underused operates like a pattern mapping machine. All new experience, all new insight and dawning realization is, in the first instance, matched to previous experience stored as templates by the brain in the neural circuitry supporting the various levels of memory. It could be said that we only see what we can remember. Now, by memory I don’t simply mean conscious memories. I am also including experience that has become forgotten. Memory is like the hard disc of a computer, nothing is ever lost, it just disappears from executive level recall. This is what we call the repression of unconscious memory. Repressed memory is what really is controlling our behaviors. Hence human beings are consigned to madness, i.e. madness defined as unconsciously repeating the same mistakes while consciously hoping for different results. One of the most important prayers I know is: God, show me the pieces of the puzzle I don’t yet see. Is it possible that through prayer we might become open to the truly novel, the completely new? Could what we call prayer be one of the principle ways we escape from the limitations of our own individual memories? I want to let that question just sit for a moment. Our suffering is highly formative. Why is it that most of us, and here I include myself, remember the painful experiences of life more than we remember the joyful ones? In risking to offer a tentative answer, I would suggest that this is part of what the Apostle Paul calls the experience of the flesh. Evolution has equipped us as animals to pay close attention to pain. In human beings, somatic pain (physical pain) breaks into our self-awareness as emotional suffering, and anxiety. My guess is that most of us will either remember, or have seen pictures of an archaic instrument called a turntable. Turntables played shiny, black, Bakelite (a pre-runner to plastic) and then plastic discs, called records. The surface of the record was scored with grooves. Each groove was the physical impression of sound, imprinted upon the surface of the record. These grooves were referred to as tracks, and this word still is used to refer to units of music that are no longer physical groves in a plastic surface. The turntable played a needle across the grooved surface of the record converting the sound impressions back into audio sound. When a favorite track was overplayed or the surface of the record became scratched, the needle would get stuck in the worn track or jump across the record following the line of the scratch, lodging in the damaged groove. When this happened it repeated a section of the music over and over again. The needle would then have to be picked up and moved over to the next groove for the music to continue. Evolution has equipped a part of our brain to record painful experience in deeper grooves upon our memory. It’s a survival mechanism. So the child does not easily forget the experience of touching the gas flame, neither is the early experience of unmediated anxiety (panic) easily forgotten either. The apprehension of Joy, on the other hand, seems to belong to another region of memory, more easily overridden by the deeper grooved painful memories. I am going to forget the 50 people who complimented me on last Sunday’s sermon and remember the one person who criticized it. That is because self-doubt and a sense of inadequacy has formed a gouge of insecurity in comparison to the shallow grooves left by a life-time of relative, success. We easily remember the pain and forget the joy. Or, we are so deafened by the repetitive sound of our pain (the needle getting stuck) that we can’t hear the sound played by more joyful tracts of experience. To switch back to my first analogy, we see only what we most remember. Could what we call prayer be one of the principal ways we escape from the limitations of our own individual memories? In theological language the question becomes does prayer work, can we be healed through prayer? Likewise, the Spirit helps us in our weakness; for we do not know how we ought to pray, but that very Spirit intercedes with sighs too deep for words. The Spirit of God, working deep within us with sighs and groans too deep for words utters us into new experience. We begin to glimpse the pieces of the puzzle we have not seen before. Note that Paul says we not only don’t know what it is we need to pray for, but we can’t know what we really need to pray for. We simply open ourselves in prayer, trying to keep expectation to a minimum. Through the workings of the Spirit we begin to glimpse the outlines of the bigger picture within which our current living is unfolding. That is why waiting does not diminish us, any more than waiting diminishes a pregnant mother. We are enlarged in the waiting. We, of course don’t see what is enlarging us. But the longer we wait, the larger we become, and the more joyful our expectancy. we know that all things work together for the good of those who love God, and who are able to co-operate (collaborate) with God’s purposes. Two elements seem necessary in becoming freed from the tyranny and limitation of painful memory. The first element is love. We long for a deeper experience of love. This is love of God first and foremost. Yet, because love of God cannot be separated from love at the human level, we long for a deepening of the experience of both loving and being loved. The deepening of love manifests as an increase in generosity. Yet, generosity doesn’t just happen. It is always first and foremost an experience of taking a risk. Generous living moves us beyond the barriers we erect for our own safety. Generosity reconnects us to the primary experience of gratitude. Gratitude is the first fruit of living spiritually. The second element is co-operation or collaboration with God. Paul speaks of us being called according to God’s purpose. Theologically, God is omnipotent, yet because of free will nothing happens in our relation to God by dictat. There is a reciprocal process whereby God invites, and we must accept. This means that prayer is always our response to the prior invitation from God to come into relationship together. I may have memories yet, there is more to me than these memories. Waiting, watching and not acting opens a chink through which to glimpse that which we can’t yet see. Through this chink, the Holy Spirit with sighs and groans too deep for words, or even conscious thought, is enlarging our capacity for seeing and hearing and experiencing the more than, i.e. the new. Even in a country you know by heart it’s hard to go the same way twice. The life of the going changes. The chances change and make it a new way. Any tree or stone or bird can be the bud of a new direction. The natural correction is to make intent of accident. To get back before dark is the art of going. The Apostle Paul in the 8th chapter of his Letter to the suffering and hard-pressed Christians in Rome draws a distinction between the life of the flesh and the life of the Spirit. I suggested at https://relationalrealities.com/2014/07/19/romans-8-viewed-through-a-seashore-prism/ that we translate flesh into appetite or desire, and spirit into intention. The natural correction is to make intent of accident. It’s summer in Rhode Island. I’m stating the obvious to be sure, for everywhere in the Northern Hemisphere, it’s summer. Being new to Rhode Island I am sensitive to the experience of it being summer, because while it reminds me in many ways of an English summer, it contrasts dramatically to the Phoenix, Arizona summer, from which I feel I have escaped. This is my recent experience of summer as a furnace heat of the sun driving people into air conditioned hibernation. In Rhode Island, summer is a time to come out of hibernation and to reconnect with the delights of living on the coast in a State of the Union, which seems to be more sea than land. I notice that the cells of my body respond in some mysterious way to the siren call, not so much of the sea, which is frightening in its vastness, but of the seacoast. I felt this intensely, as last Sunday evening Al and I were treated to dinner at the Dunes Club in Narragansett. The place where we ate was a mere hands breath away from the sound of the sea lapping against the human-made barrier of the sea wall. For me, the lasting impression is not so much of the sea, but of a liminal space between land and sea. Liminal space expresses the experience of inhabiting both sides of a boundary. 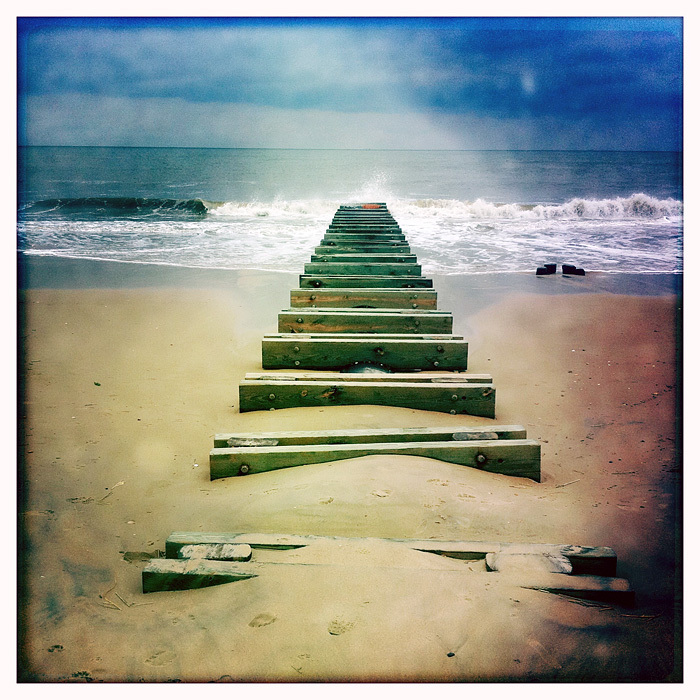 The seashore is a liminal space where land, water, earth and sky, with a fluidity, transition in and out of each another. This liminal-transitional place evokes the ancient primal memory of the sea as the birthplace for all life. This primal memory of life’s aquatic origin lodges in the unconsciousness of the human body’s cellular memory. The significance in the experience I am trying to articulate, seems to lie in seashore as a place on the margins of both land and sea, a place of transition where I experience a fluid process of dynamic motion, of ebb and flow, of merging and separating. The power of this experience lies only partly in its sensory nature. It’s also an experience that is beyond the senses. The word I give to this is intuitive, some might say spiritual. At the intuitive level of experience being on the seashore evokes in me a profound awareness of the transition between having and yet still waiting, of now, and still not yet. It is Saturday morning again. I rise and sit to address God’s invitation to come into conversation with the lectionary readings for Sunday. The week leading up to this moment has been a process of unconscious percolation, punctuated by the moments of conscious panic – a certain degree of groaning in travail, being subjected to futility, fearful of not having anything to say come Saturday morning. As I sit, I note with curiosity that on my way to address the words of the Apostle Paul in the 8th chapter of his letter to the Romans, this is how I begin – by reflecting on the transitional dynamics of the seashore. I am curious because before I sat down to write I had no notion that these would be the recollections that would come to mind as I begin my journey towards Romans 8: 12-25. Rather like the sea, Paul’s writings often strike me as a little two vast for easy comment, and in places, unpredictably contradictory. At first sight it’s easy to read Paul as making the all-too familiar dualistic distinction between the body as bad and sinful in its carnality, and the spirit as good and pure. It’s easy to dismiss Paul’s distinction between flesh and spirit as the dualistic expression of a pre-psychological mind. However, I think a dualistic reading is more our problem, than Paul’s. After all, we are the heirs to the triumph of Greek philosophy with its inherent dualistic, body-spirit split perspective. We should remember that the Classical dualislism is the philosophy Paul most confronts, challenging its assumptions at every turn with the paradoxical message of the cross and resurrection of Christ. For Paul the paradox of the cross and resurrection is the challenge to the dualism of the world he lives in, not its confirmation. Today we are just as dualistic as our forebears, the difference being that we now elevate the body over the concerns of the soul. A post-psychological, and hence post-dualistic reading of Paul’s distinction between flesh and spirit might be rendered as a distinction between appetite and intention. Paul’s startling message to the Romans is that it is through the transitioning back and forth between body and spirit within one integrated experience, that salvation is offered. The tension Paul identifies is not a tension between the spiritual and the physical, but between living life controlled by self-seeking appetites and a examined life directed by an intention that opens us to the transformation of grace. So don’t you see that we don’t owe this old do-it-yourself life one red cent…. God’s spirit beckons. There are things to do and places to go. We are children of God – if children then we are heirs of God – and if heirs of God then we must be joint heirs with Christ – sharing the same inheritance as Christ – which is why this life involves both suffering and joy. It’s not only at the individual level we participate in the same life that Christ lived but the very world itself – the entire cosmos is on a journey into the realization (groaning in travail) of the glory to be revealed in us as children of God. Yet, how can we not be mindful of a world groaning in travail (King James), subject to futility (NRSV), more or less held back (Message) in a week when children die on a beach in Gaza as an unintended consequence of the escalation of violence between Hamas and Israel, when a commercial airliner is shot down on the border between the Ukraine and Russia, when each week we face an influx of vulnerable, unaccompanied children on our southern border, seemingly unable to embrace the primacy of compassion over politics. Everything in creation is being more or less held back. God reins it in until both creation and creatures are ready and can be released at the same moment into the glorious times ahead. (Romans 8:21 the Message translation). At the intuitive level of experience being on the seashore evokes in me a profound awareness of having and yet still waiting, of now, and still not yet. This intuitive expression of the sensory experience of land and sea, earth and sky as interweaving transitions is a good way to understand the relationship between flesh and spirit, at both the individual and the cosmic dimensions of experience. There is no demarcation; no strict dualistic separation between the physical and the spiritual, between realization and still waiting, between frustration and fulfillment, each is simply a place on a continuum of the ebb and flow. Paul’s message is that in Christ, God has made the outcome of liberation inevitable, even while we live through the messiness of the tension between our desire to have our small-self appetites satisfied (which is the root of all the pain and suffering we inflict upon one another) and our intention to open to our greater-selves represented by the life in the spirit. In the meantime we wait in hope, remembering that hope is always an expectation of what has not yet arrived. The object of our hope is not the best we can expect. The object of hope is something just beyond what we are capable of imagining. Hope is faith in things unseen, as the writer to the Hebrews states it. Yet, while the object of hope is beyond our imagination, the very act of hoping means that we are being conformed into alignment with that for which we wait in hope. In the meantime, as the Message translation words it: Meanwhile, the joyful anticipation deepens! When we manage to peel back nearly 2000 years of dualistic and patriarchal reading of Paul we discover something startling at the heart of his Christian message. Paul fundamentally understood that God valued the human body so much that he came to live within the limitations of having one. He preached a God who valued the human body so much that it is through the physicality of a bodily resurrection that salvation comes into the world. Standing on the seashore, experiencing the interplay between land and water, earth and sky, I experience the primal resonance of the sea as the womb of all life on earth. This awareness or resonance is lodged in the memory of every cell in our human bodies. Similarly, might this not also be a metaphor for the relationship between flesh and spirit. The experience of spirit is a deep cellular resonance always in a process of emerging to give substance and shape to our conscious intention. In Matthew 13:1-23 we are offered one of the most evocative of all Jesus’ parable teachings. Matthew has Jesus not only tell the parable story, but also offer an allegory of the parable’s meaning. This is unusual for Jesus normally lets the parable speak for itself. In fact the effectiveness of a parable lies in not resorting to an allegorical explanation of its meaning, for its meaning is fluid and lies in it’s power to confront the hearer’s normative assumptions about how things should be. This has led some scholars to suggest that the allegory section from 18 – 23 is an addition, perhaps by Matthew. Jesus’ detailed explanation using the device of allegory from v 18 onwards seems to be in marked tension with what he tells the disciples in v 13 – the gist of which is that the power of a parable lies in its ability to elude the hearers understanding as long as he or she remains unwilling to let the paradox at the heart of the parable turn normal expectations upside down. In the Early Church the greater the distance between the community both in time and culture from the original Jewish context of Jesus’ parabolic teaching, the more likely the need for an allegorical interpretation. While allegories are instructive, they tend to tie down the fluid nature of the parable, confining it to a set meaning. Turning a parable into an allegory is a very non-Jewish thing to do, and hence another paradox for Matthew is the most Jewish of the Evangelists. The Lectionary has jumped us from chapter 11 to chapter 13. In omitting chapter 12, which is concerned with the religious leaders rejection of Jesus and their desire to kill him, we miss an important piece for understanding Matthew’s locating the parable of the sower at this point in his structure – between the authorities rejections of Jesus and the more intimate rejection by the people of his hometown. The import of Matthew’s narrative concerning sowing and reaping the fruit of the seed seems to lie in the recognition that some hear and receive the word, while other fail to receive, because they do not hear. This question remains central in our own reflection on the context in which we live-out our Christian faith! There are at least three if not more ways we can interpret meaning from this text. 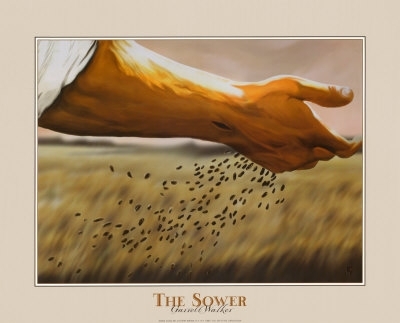 The traditional reading of the parable of the sower suggests that Jesus is the sower who sows the word of God. In this interpretation we, individually and communally, are the soil. The direction this interpretation takes us, is towards a pietistic examination of either our own failures or virtues depending on which kind of soil we think we are. The problem for me in this approach is that it’s too neat and can become in the wrong hands more than a little judgmental. It also encourages the attitude of self-improvement. By the stint of our own hard work we can become more fertile soil for the reception of the word. We celebrate ourselves as fertile soil, while judging others as not. This interpretation rests on the assumption that except for the seed that falls upon good ground the rest of the seed is wasted. We bring to this parable assumptions drawn from our modern agricultural preoccupations with the two E’s -efficient planting, effective soil husbandry. So we plough under the weeds, we sieve-out the rocks, we uproot the hedgerows, and we eradicate the birdlife. We then increase the goodness of the soil through effective use of artificial fertilizers. As in farming, so in our lives; it’s all about our own carefully generated success. A second approach to this text modifies some of the pietistic emphases of the traditional interpretation. The soil types are not distinct and mutually exclusive categories for receiving the seed. Offering a psychologically nuanced approach, the soil types when taken together represent all the ways in which the seed flourishes or dies within each one of us and within our communities. This approach requires me to be personal for a moment. In the area of my life represented by a deep longing to the core of my being to be open to an experience of the love of God, the seed finds a fertile soil environment. This is not only an internal, individual longing within me, it is also a relational longing that find fulfillment in community and relationship with others. I am faithful in private prayer and common worship, I am involved in community service and this produces a deep and rich experience of God, and the community that is God, in my life. Yet, so much of my experience is, at the same time, confined and constricted by my fearfulness. My courage and nerve fail me as I seek to take the safest path, and choose the least risky option. This is a shallow, stony soil in me where the Word of God withers for lack of the moisture of courage to risk, and hope to trust. It is only courage and hope that will take me beyond my familiar comfort zone. In other words, the birds represented by winged fears, come and devour the seed. Still struggling through the process of a major relocation of town, job, house, and friends makes me acutely aware of how the weeds of greed and phobia of scarcity grow up to choke my gratitude and restrict my generosity. In having been given so much in terms of material support and comforts, why do I seem to grow more anxious about losing what I have? As I contemplate the level of my pledge to my new Church community, the cares engendered in me by not yet knowing how much I will need to live on. My liberal credentials are sorely put to the test by the shock of moving from a low to a high tax economy. These pressures rise to choke my awareness of God’s profound generosity calling from me a response of gratitude that opens me to living generously. In this approach we see God as the sower and Jesus is the seed. The striking thing about God as sower is his recklessness and lack of agrarian efficiency. No farmer, modern or ancient – and here is the paradoxical confrontation at the heart of Jesus’ parable – would plant crops in this indiscriminate and wasteful way. Yet, God scatters the seed of the Word far and wide heedless of the type of ground upon which it falls. God scatters the seed everywhere in the world and its fruiting is not confined to having only fallen in our supposed, good soil. God is free of our petty moralistic judgments about what is efficient, what is effective, and what is ultimately fruitful. God seems to foresee the possibility of fruitfulness in our failures, and in the arid areas of life where we remain limited by our fearful self-protections. It is in failure as much as in those parts of our experience where we encounter the self-satisfaction of our own success. . I am learning the contours of a new community and for me this is, first a foremost, a listening exercise. As I listen in these first weeks, which coincide with the summer exodus of many from the regular routines of Church, something so very much needed as a time for re-creation, I hear of past initiatives judged as failures or mistakes and therefore not to be repeated. I hear of other initiatives that achieved their goal, but failed to afford those who had invested considerable time and talent with a sense of their efforts having been valued by either authority, or the community. I hear of initiatives when passion, effort, and success all came together in one place, and at one time. These are remembered with a longing to recapture or repeat those moments, even if the time has now past. In experiences and disappointments, the dynamic of relational and community life unfolds amidst the ordinariness of our hopes and dreams if we dare to entertain them. As the contours of a new community emerge into my awareness I see the hand of God indiscriminately scattering the seed of the Word in the world so that it may bear unexpected fruit in us. Another way of speaking of God’s indiscriminate scattering of the seed of the Word is to speak of God as a God of unrestrained generosity! Pietism is an approach to the spiritual life that focuses almost exclusively upon individuals and their moral worthiness. The living of the spiritual life is reduced to a concern about me, my God, and whether I am getting or doing it rightly or wrongly. Pietism flourishes in the cultural emphasis on autonomy and individuality in modern American life. This parable may also challenge us to take risks that may possibly fail; to try some things that may prove to be ineffective. Could “recklessly throwing out the seeds of God’s word” by similar to Luther’s “sin boldly”? Or to paraphrase it, “Do something, even if it’s wrong (or ineffective or inefficient)”? I’ve read business books that advise, “Be sure to generate a sufficient number of excellent mistakes.” Another book, (Sacred Cows Make the Best Burgers, by Robert Kriegel & David Brandt) offers these quotes: “Says former IBM chairman Tom Watson, ‘If you want to succeed, double your failure rate'” [p. 97]. And “Said one executive, ‘If you aren’t making mistakes you aren’t doing anything worth a damn'” [p. 99]. Another book by Robert Kriegel (and Louis Patler) is entitled, If It Ain’t Broke … Break It! : and Other Unconventional Wisdom for a Changing Business World. The willingness to make mistakes, to waste time and energy is part of the creative process. Such creativity may result in a wonderful break through or new product, etc. Why is it that so many people in the church, which is to be centered on forgiveness, find it so difficult to risk making a mistake — for the sake of the gospel?